To foster knowledge and ideas exchange within the marine environmental science community and, in particular, to promote interdisciplinary studies, the State Key Laboratory of Marine Environmental Science (MEL) of Xiamen University initiated the Xiamen Symposium on Marine Environmental Sciences (XMAS), with the overarching theme of The Changing Ocean Environment: From a Multidisciplinary Perspective. 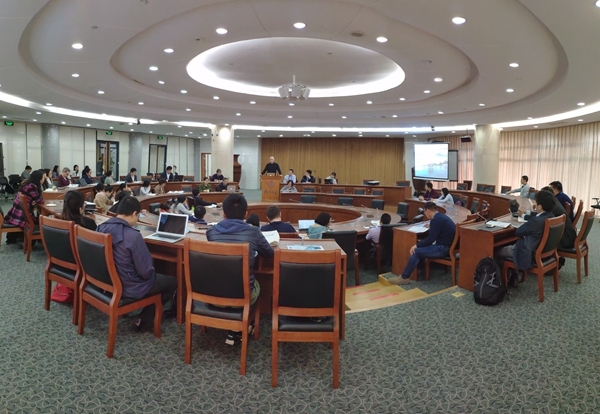 The fourth iteration, XMAS-IV, was held in Xiamen from January 6-9 2019. It was organised and sponsored by MEL, and the National Natural Science Foundation of China. SOLAS was one of the co-sponsors of this event. The SOLAS session at XMAS IV was convented by Guiling Zhang (Ocean University of China, China), Huiwang Gao (Ocean University of China, China), Mohd Talib Latif (Universiti Kebangsaan Malaysia, Malaysia), Jun Nishioka (Hokkaido University, Japan), Senchao Lai (South China University of Technology, China), Bingbing Wang (Xiamen University, China). In this session, the SOLAS scientific community exchanged new ideas and discussed the latest achievements in our understanding of the key biogeochemical-physical interactions and feedbacks between the ocean and the atmos-phere, and of how this coupled system affects and is affected by climate and environmental change. Consevutive workshops on SOLAS Core Theme 4 and 5 were held from the 27th until the 29th of November 2018 in Roma, Italy. Workshop 1 focused on challenging topics in the field of air-sea interactions and atmospheric chemistry. It was organised jointly by SOLAS and IGAC. The workshop 1 especially addressed the influence of the coastal pollution (air and water) on the chemistry of gas and particles in the marine environment, as well as the effects on climate and human health. 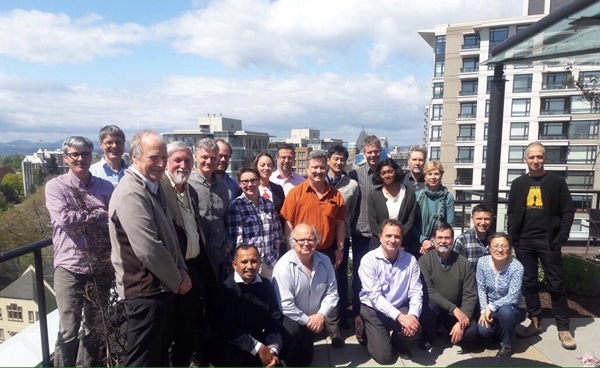 Workshop 2 was the realisation from the SOLAS national annual reports of the existence of many large programs aiming at improving our understanding of the interconnections between ocean and aerosols and ultimately clouds. The timing seemed just right to bring these people together and see what they have to say and try to expand from the local/temporal scale of a single project to the global scale. For this we identified key similarities and differences in the findings of the different programs (where they overlap) as well as complementary information where they don’t. SOLAS convened a Research Progam meeting on May 1 2018, in Victoria, Canada. BEPSII, CATCH, CliC, CLIVAR, CNC/SCOR, GEOTRACES, iCACGP, IGAC, IMBeR, ONC, PCIC, PICES, PICS, SCOR, University of Victoria, and WCRP presented at the meeting. To facilitate the exchange of ideas and information about developments in remote sensing that can provide new information about the ocean-atmosphere interface, and to help forge collaborations between workshop participants and with the wider community, From the 13th until the 15th of March 2017 the SOLAS workshop "Remote Sensing for Studying the Ocean-Atmosphere Interface" took place at Bolger Center in Potomac, USA. The abstract booklet is available in PDF format for viewing and printing here. Front row left to right: Gary A. Wick, Ajoy Kumar, Johnson Zachariah, Alexander Gilerson, Kirk Knobelspiesse, Jack Kaye, Paula Bontempi, Prabhat K. Koner, Chris Ruf, Baijun Tian, Magdalena D. Anguelova, Diego Fernández Prieto, J. Vanderlei Martins, Rachel Pinker, Abderrahim Bentamy. Middle row left to right: Malgorzata Szczodrak, Isaiah Lonie, Chelle L. Gentemann, Kyle Ehmann, Peter Cornillon, Robert Foster, Alexander Smirnov, Ivan Savelyev. Back row left to right: Xiujun Wendy Wang, Lorraine Remer, James Carton, Diego Loyola, Peter Minnett, Lisa A. Miller, Brent A. McBride, Amir Ibrahim, Hiroyuki Tomita, Oliver Wurl, Phil Hwang, Hongbin Yu, Xuepeng Zhao, Eric C. Hackert, Santha Akella. Missing: Santiago Gassó, Abhishek Chatterjee, Stéphane Saux Picart, Leonid Yurganov. The SOLAS Town Hall ‘Expanding involvement and setting priorities’ was organised on 13 February 2018, with the goals to introduce the SOLAS science plan and international activities, to discuss how SOLAS can be useful to your research, to generate ideas for new initiatives and collaborations, and to explore priorities for expanding the US SOLAS program. The US SOLAS national representative Rachel Stanley hosted this event. The Town Hall was joined by the SOLAS SSC Chair Lisa Miller and SSC members Philip Boyd, Peter Minnett, Jun Nishioka, and Guiling Zhang. They presented about their research and how they are connected with SOLAS. The SOLAS IPO was represented by Jessica Gier and Li Li. SOLAS and the Sustainable Shipping and Environment of the Baltic Sea region (SHEBA) joined forces to organise a two-day conference “Shipping and the Environment - From Regional to Global Perspectives”, which was held at the University of Gothenburg’s conference centre on 24-25 October 2017, and attracted 117 participants from 15 countries. The conference was followed by a SOLAS workshop on “Shipping” on 26 October 2017. SOLAS sub-session on "A tribute to Prof. Roland von Glasow" in the 2017 Joint IAPSO-IAMAS-IAGA Assembly, 27 August-1 September 2017, Cape Town, South Africa. From 28 August until 1 September 2017, the session M01 “Atmospheric Chemistry and Physics for the 21st Century” has been organised under the auspices of the International Commission on Atmospheric Chemistry and Global Pollution (iCACGP) at the International Convention Center in Cape Town, South Africa. The sessions on August 28 and 29 were dedicated to SOLAS as a tribute to Prof. Roland von Glasow, who served on the Scientific Steering Committee of SOLAS (2008-2013), and was an active Commission Member of iCACGP when he suddenly passed away in 2015. Alina spend one week working with us in the SOLAS IPO at GEOMAR. My name is Alina Correll, I am 17 years old and I visit the 11th grade of Bergstraßen-Gymnasium Hemsbach. In the week from 12th to 18th August 2017, I was given the opportunity to do an internship in the International Project Office of the ‘Surface Ocean - Lower Atmosphere Study’ (SOLAS) at the GEOMAR Helmholtz Centre for Ocean Research Kiel, Germany. It was an eventful week during which I learned a lot about marine biology, how and where to study it and what kind of job possiblilites one has. Furthermore, I gained many impressions on working at the GEOMAR. The internship started at the project office, where Dr. Jessica Gier welcomed me to SOLAS and explained the aimes and the approach of the project to me. I was surprised by the huge number of scientists from all over the world working together in one project. Afterwards, we went on a guided tour to the Technology and Logistics Centre where I saw and learned about the research vessel of GEOMAR and its underwater vehicles like for example the Remotely Operatet Vehicles (ROVs), the famous submersible ‘Jago’ and other Autonomous Underwater Vehicles (AUV ABYSS). In addition to storing all of those technical instruments, there are tanks in which they can be tested and a factory hall where new equipment can be built. It was very fascinating to see all those vehicles which seem quite inconspicuous and small but are packed with the newest technologies and work under extreme conditions. On my second day, Dr. Jessica Gier and I visited the Zoological Museum of Kiel University with its exhibitions ‘Future Oceans’ and ‘Deep Sea’, which were created in cooperation with GEOMAR. Furthermore, the museum displays many marine specimen among which are 12 original whale skeletons that I found highly interesting. I spent the rest of the day in the SOLAS Project Office, gaining insight on the work as a project officer and helped with some tasks like designing a logo advertising the SOLAS summer school or compiling e-mail lists. In order to be able to experience some work in the field of research, I had the possibility to spent one day at the laboratory of the research unit ‘marine microbiology’ where I learend a lot about working in a laboratory, did fascinating experiments of which I could do some by myself. After Dr. Kristina Bayer had provided me with detailed explanations on the main research topics of the unit and familiarised me with the security instructions, she showed me around the laboratory, explaining the most important instruments. After that, we worked with the ‘cell sorter’, a quite new piece of equipment used at GEOMAR that can differentiate between the cells of different species of algae or bacteria with the help of laser rays and can then separate them into test tubes. Afterwards, we took a look onto some of those algae under the microscope. As scientists often have to take care of marine animals or plants they are doing research on, I spent one day as a trainee at the GEOMAR Aquarium where I fed the animals and cleaned their tanks. My last day was again spent in the SOLAS Project Office where I helped Dr. Jessica Gier and Dr. Emilie Brévière. Again, it was very amazing to see the huge amount of communication between scientists from all over the world. All in all, I had a very interesting internship. I really enjoyed my time at the GEOMAR and am grateful for the experiences I was able to make and the information and insights which I gained on scientific work. I am now quite sure that I want to study marine biology. Thanks to all the friendly people I met during this week, who were very patient explaining me everything, and answering all my questions. Special thanks to Dr. Emilie Brévière and Dr. Jessica Gier for making this internship possible and spending so much time with me. From the 15th until the 18th of May 2017 the SOLAS science workshop "Frontiers of ocean-atmosphere interaction: Air-sea interface and fluxes of mass and energy" took place at IESC in Cargèse, Corsica. The facilities bordering the Mediterranean Sea provided a perfect setting. IESC is a well known venue for the SOLAS community, as it hosted the 2011 SOLAS Summer School (and will again in 2018). It was a busy and fruitful week. A colourfull group of senior and early-career scientists as well as PhD students took part in the programme of morning plenary sessions, afternoon breakout sessions and the daily 'open-air' poster exhibition. Research to the ocean surface microlayer from a large diversity of approaches and backgrounds was presented in this workshop. Topics ranged from advances in biochemical research to wave modelling, and from the interaction between the microlayer and clouds to rain-induced sea surface anomalies. The ocean surface microlayer (OSML) provides significant challenges for both observationalists and modellers. To improve our understanding of the OSML and how it affects air-sea exchange processes, interaction and collaboration between different research communities is essential and still needs to be further advanced. The organizers would like to thank all speakers and participants to the workshop for their contributions. A full report of the workshop will be made available through the SOLAS website in the coming months. The organizers would like to thank all speakers and participants to the workshop for their contributions, and also the sponsors ONRG, ESA, SOLAS, WCRP and the University of Galway. A full report of the workshop will be made available through the SOLAS project website later in the year. Workshop participants (alphabetical order): Magdalena Anguelova, Tom Bell, Oyvind Breivik, Adrian Callaghan, Kai Christensen, Kyla Drushka, Anneke ten Doeschate, Anja Engel, Leonie Esters, Luisa Galgani, Valentina Giunta, Luciá Gutiérrez-Loza, Nathalie Hayeck, Sok Kuh Kang, Kyeong Ok Kim, Ilan Koren, Stéphane Laussac, Peter Liss, Anoop Mahajan, Christa Marandino, Wade McGillis, Nicholas Meskhidze, Francesc Peters, Henry Potter, Lucia Robles Diaz, Anna Rutgersson, Matt Salter, Joel Sudre, Graig Sutherland, Liselotte Tinel, Royston Uning, Penny Vlahos, Evangelos Voyiatzis, Rik Wanninkhof, Brian Ward, Johnson Zachariah, Sebastian Zeppenfeld. The CATCH mission is to facilitate atmospheric chemistry research within the international community, with a focus on natural processes specific to cold regions of the Earth. Cold regions include areas which are seasonally or permanently covered by snow and ice, from the high mountains to the polar ice sheets and sea ice zones as well as regions where ice clouds that undergo chemistry are found. CATCH is an emerging IGAC Activity on Chemistry, Biology and Physics in Cold Regions. Establish background composition (trace gases and aerosols) in cold regions that are undergoing industrialization as well as impacted by climate change. The first CATCH community workshop was held in Guyancourt, France on 19-20 April 2017. The workshop was co-sponsored by IGAC, SOLAS, and the French project PARCS. The main aim of the first CATCH workshop was to initiate development of a cross-disciplinary research community and establish linkages within neighboring disciplines including atmosphere, ocean, ice, snow, biology, clouds, dynamics, and fundamental chemistry. The workshop also aimed to foster future collaborative work by highlighting cross-disciplinary research questions and identifying future research needs/opportunities. A more detailed workshop report will be released soon! To stay up to date with CATCH's news, subscribe to the CATCH mailing list here and read the last CATCH Newsletter May 2017 here. Download the article on BEPSII published in January 2017 in the PICES Newsletter. It depicts the beginning of BEPSII few years back. Meeting participants: Front row left to right: Jeff Bowman, Jacqueline Stefels, Letizia Tedesco, Maria Vernet, Daiki Nomura, Melissa Chierici, Ag-neta Fransson, Ana Aguila-Islas, Nadja Steiner, Marie Kotovitch, Lisa Miller, Daniella Koenig, Marion Lebrun, Bonnie Raf-fel, James France. Mr. Gian Luca Galletti, Italien Ministre of the Environment, Protection of Land and Sea. This non-binding manifesto aims to protect oceans and has already been signed by over a hundred MOW participants. Each participant is invited to add her/his signature if she/he wishes to. We were a small, international group, with participants from Canada, Nigeria, Germany, France, the UK, and Monaco, as well as remote attendance from India and China. The goal of the workshop was to write an interdisciplinary review paper, entitled “The Ocean’s role in CO2 mitigation”, related to blue carbon and the open ocean and shelf areas. The expertise of the participants ranged from law to economics to carbon cycling within the Earth system and gas exchange, with much in between. The overall objective of the SOLAS Science and Society meetings is to perform scientific research at the boundaries of natural and social science, with an interface to stakeholders and policymakers. The value-added in this workshop was to join scientific disciplines on this societally relevant topic that is largely unexplored to date and to convey the messages to decision-makers. As such, we are able to develop a comprehensive manuscript that includes the economic value of carbon in the ocean, extending past the typical coastal blue carbon content. Workshop participants: Martin Johnson, Nathalie Hilmi, Erik van Doorn, Christa Marandino, Helmuth Thomas, Mary Omolara, Manoranjan Mishra, Alain Safa, Laura Recuerto Virto, Denis Allemand, Peter Swarzenski, Olga Anghelici, Shang Chen, Dorothée Herr. From February 27 to March 2 2017, two workshops took place at the University of East Anglia, Norwich, UK under the auspices of the Joint Group of Experts on the Scientific Aspects of Marine Environmental Protection (GESAMP) Working Group 38. My name is Tanja Wirtz and I visit the 10th grade of the Franziskus Gymnasium Vossenack. From 22-28 February 2017, I had the opportunity to do an internship at the International Project Office (IPO) of the Surface Ocean – Lower Atmosphere Study (SOLAS) at the GEOMAR Helmholtz Centre for Ocean Research Kiel. This internship provided me with several interesting impressions. At the beginning, Dr. Emilie Brévière and Dr. Juergen Weichselgartner welcomed me and I was introduced to the SOLAS project, its scope, structure, and the various activities to study the interactions between ocean and atmosphere. I could gain insights in the daily work of an international research project. For instance, I helped designing a new scientific poster for SOLAS. Furthermore, I had the chance to follow a job interview. Two candidates applied for a science officer position at the IPO. This experience will be certainly useful for my own applications in the future. On the second day, I attended a lecture by Professor Andreas Schmittner. His lecture “Reconstructing the glacial ocean: very weak Atlantic overturning and iron fertilization maximize carbon storage” was really interesting, although I am not used to listening to presentations in English. I discovered that English plays an important role in science. Therefore, good English skills are essential to communicate globally and exchange results of scientific experiments. Another great experience was my day at the Aquarium of GEOMAR, where I fed different animals and plants, as well as cleaned the aquariums. As a result, I learned a lot about these creatures and their habitats. It was a very exciting practice, especially feeding the seals and the new-born sea horses. The internship was fun and I gained much experience. The IPO staff was really friendly and I learned a lot about scientific work. Thanks to Dr. Emilie Brévière and Dr. Juergen Weichsel­gartner for providing this possibility. I was really impressed by the amount of communication and cooperation between the local staff and their global network. Their work is very important for our society and our planet. Training and networking events on ocean acidification took place for the first time in West Africa at Dakar (Senegal). The events were organized by Future Earth Coasts with the support of KOSMOS Energy, SOLAS, MaREI, OA-ICC, IRD, to name a few, represented by participants of the events. The training workshop assembled 15 participants from Senegal, Benin, Togo, Cameroon, Nigeria, Benin, and Cote d’Ivoire, and 6 trainers coming from France, Sweden, USA, Spain and South Africa. Lectures and discussions covered an introduction to oceanic conditions off West Africa, the goal and urgency to study ocean acidification, as well as the chemistry involved in the acidification of the ocean and its impacts on marine biodiversity. Theory was about ocean acidification, measurement techniques, design of relevant acidification experiments, and manipulations in the field and in the laboratory. One day field trip was organized for practical training where aquarium experiments of ocean acidification were built up in real time. The trainees received their certificates of completion. Next to the training, a networking event took also place with interactions with the training participants on plenary sessions. About 17 networking participants were coming from Nigeria, Ghana, Morocco, Tunisia, Kenya, Cameroon, Cote d’Ivoire, Tanzania, Algeria, Togo, Benin, Egypt, Madagascar, Senegal, and South Africa. Presentations and discussions took place for developing the OA-Africa network and knowledge exchange on operational outcomes and identification of current needs (resources and capacity), identification of collaboration opportunity including funding, and of outputs and avenues for dissemination in Africa. Plans for white papers were presented to define current knowledge of OA-Africa and next steps forward. A steering committee involving researchers from Africa was then designed to provide guidance and direction of the network. A dinner event was hosted where a range of NGOs, practitioners and government officials from Senegal was invited along with the scientists. This event recognised the importance of involving organisations and stakeholders based in Senegal who can provide important in-country context, expertise, and experience. This dinner event provided an opportunity to connect to researchers, NGOs, and government officials in Senegal who are working tirelessly to manage environmental and ocean resources with scientists and students working on ocean acidification across Africa. When we outlook the future of SOLAS, not only in coordination in cross-disciplinary basic research, but also in climate and ecosystem services, challenges remain. Asian countries have made considerable contributions to SOLAS in the broad context of international collaborations, especially in the fields of ocean carbon cycle, air-sea exchange and atmospheric deposition to oceans. Considering Asian countries acting as the world economic engines, SOLAS studies therein should strengthen internal collaborations and pioneer some international collaboration programs to better service future social-economic activities on the earth. This Future SOLAS symposium aimed to foster the exchange of ideas and knowledge between Asian scientists as well as the communication with the international community and to promote collaborations within Asian countries for SOLAS research and activities over the next decade. A free workshop on the topic of `SOLAS Science and Society` took place in late October 2016. The workshop brought together researchers in the field of ocean-atmosphere interactions and social scientists. One of the goals of Future Earth, the newest SOLAS sponsor, is to more tightly couple science and society. This is a rather bold new step for SOLAS scientists, as to date the most intense coupling in our community has been only on the topic of geoengineering. During the SOLAS Open Science Conference in Kiel in September, 2015, a discussion session was held regarding this idea. One aim of the discussion was to identify SOLAS scientists interested in pursuing this integrating effort and some ideas on topics and procedures. The main outcome of the discussion was that there is clear interest within the SOLAS community to participate in joint scientific research with social scientists. In order to facilitate this process, a two-day workshop focusing on three separate topics was held. The shipping industry and air-sea interactions. A highly successful workshop sponsored by SOLAS and ESA took place 13-15 June 2016 at the ESA facilities in Frascati, Italy. The workshop was based around the topic of “Harnessing Remote Sensing to Address Critical Science Questions in the Ocean-Atmosphere Interface". A commentary manuscript is now being prepared for the journal Elementa: Science of the Anthropocene and will present to the Earth system science community the new ideas generated at this workshop, including how existing and possibly future remote sensing tools could be used to answer these questions. On 9-10 January, Brian Ward from the National University of Ireland in Galway with support of the SOLAS International Project Office hosted a successful workshop. Current and former SOLAS Scientific Committee members, early career scientist and IPO staff met to further develop and plan SOLAS in its next phase. Special interest was taken in considering the outcome of the community consultation that took place during the last couple of months in 2013 and the input of the highly constructive early career scientist workshop that took place in early December of last year. Major steps have been accomplished in the layout of Future SOLAS in the context of the current SOLAS scientific sponsors and the Future Earth initiative. A document describing the next phase of SOLAS is well underway, an advanced draft is expected to be ready in late spring/early summer 2014. Dr. Tom Bell from the Plymouth Marine Laboratory (PML) hosted a very successful workshop to brainstorm on the scientific scope of Future SOLAS. Thirteen bright and highly motivated SOLAS early career scientists from around the world, many of them SOLAS Summer School alumni (< 10 years after PhD), met and constructively brainstormed about the next 10 years of SOLAS. To help place Future SOLAS in the context of the Future Earth initiative, two socio-economists from PML were invited to join them. Together the group defined what ecosystem services mean in terms of Future SOLAS science and identified where the natural and social sciences can work together. The recommendations and outcome of this workshop will feed into a document describing the next phase of SOLAS. About 25 SOLAS scientists from Swedish Institutions met at the Royal Swedish Academy of Sciences in Stockholm. Three SOLAS Scientific Steering Committee members and three representatives of Swedish funding agencies joined them to discuss on how to enhance the engagement of Swedish researchers in SOLAS, in particular in the context of the Future Earth initiative. The participants successfully established a matrix mapping Swedish capacity in relation to the SOLAS broad scientific scope and a list of current members of the Swedish network. They are currently working on providing a complete annual report to SOLAS and setting up collaborations. They also discussed options about having such a workshop annually. This successful workshop was initiated, organised and supported by the Swedish Secretariat for Environmental Earth System Sciences (SSEESS).